Rigid Correx Multi Message Site Sign 750mm x 1000mm. 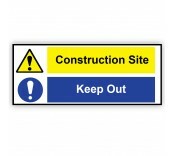 This Multi Message Site Signs conatins..
Site Safety Correx Sign 800mm x 600mm 4mm Correx .. Danger Construction Site/Keep Out 600mm x 400mm 4mm Correx ..
All Drivers and Visitors Must Report to Site Office 600mm x 450mm 4mm Correx ..
Site Safety Starts Here 400mm x 300mm 4mm Correx ..
Scaffolding Incomplete Don Not Use 400mm x 600mm 4mm Correx ..
Children Must Not Play On This Site 400mm x 600mm 4mm Correx .. Danger Construction Traffic 200mm x 300mm 4mm Correx ..
Construction Site Keep Out Sign 1mm Rigid PVC Site Safety Sign 600mm x 200mm .. Danger Keep Out Sign 1mm Rigid PVC Site Safety Sign 600mm x 200mm ..
Site Office 1mm Rigid PVC Mandatory Site Safety Sign 600mm x 200mm ..
All Visitors & Drivers Must Report To Site Office 1mm Rigid PVC Mandatory Site Safety Sign ..
Site Safety Starts Here 1mm Rigid PVC Mandatory Sign 600mm x 200mm ..
Pedestrian Route (Arrow Left) 600mm x 200mm 1mm Rigid PVC ..
Pedestrian Route (Arrow Right) 600mm x 200mm 1mm Rigid PVC ..
10mph Correx Sign 400mm x 400mm 4mm Correx ..
15mph Correx Sign 400mm x 400mm 4mm Correx .. Caution Site Entrance Correx Sign 600mm x 400mm. Ideal for attaching to site fencing. 4mm .. Caution Site Traffic Correx Sign 600mm x 400mm. Ideal for attaching to site fencing. 4mm C..
Site Access Correx Sign 600mm x 400mm 4mm Correx ..